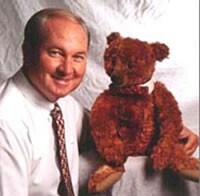 Ken's job allowed him to travel the world, where he began his teddy bear education at museums, art galleries and antique shops. His appetite grew for books about Teddy Roosevelt, and this helped establish him as an expert. To this day he reads and traps images of bears in his memory, plus adding old bears to his personal collection. Ken enjoys the history behind each bear he sees or reads about and absorbs this information like a sponge, which is crucial for appraising bears. Ken Yenke, a native of Cincinnati, moved with his wife Brenda first to Indianapolis as a sales manager, then on to Philadelphia and finally settling in the Cleveland area. A corporate account manager by day, he soon found himself devoting time to his passion of teddy bear collecting. 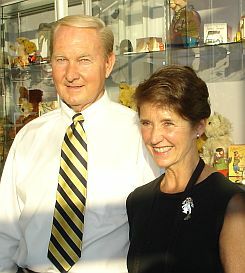 Brenda and Ken share their love for teddy bears. Brenda is an accomplished seamstress who can historically correct and restore original teddy bears.